CD review: "Shoulder to Shoulder"
Among the last original performers of the Piedmont style of blues, John Cephas and Phil Wiggins are also among the last of their generation of guitar-harmonica duos  a style of American music that traces itself back a century or more. On a new album from Alligator Records, the now-veteran duo continues to carry forth the musical traditions of the Viriginia-Carolina region that spawned the Piedmont style (made famous in earlier generations by Brownie McGhee & Sonny Terry, and the Rev. Gary Davis). Quick, lithe guitar lines from Cephas (but never showy) and broken-chord lines on harp by Wiggins create a distinctive sound  even on the handful of songs written by others. The two are joined on this outing by pianist Ann Rabson (of Saffire: The Uppity Blueswomen) for half the tracks, and she lends a fatter sound without actually changing the dynamic. 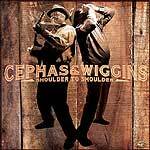 With five songs written or co-written by Cephas, covers of songs by Sleepy John Estes and Jesse Fuller, and the two men still in their musical prime, "Shoulder to Shoulder" is a heck of a treat for blues fans  or anyone who likes traditional acoustic music.